Indian 3000-kg class satellite bus for use in geostationary missions. Power system 6500 watts. Status: Operational 2005. First Launch: 2005-12-21. Last Launch: 2015-11-10. Number: 7 . Insat 4A, 4B Communication satellite built by ISRO for Insat, India. Launched 2005 - 2007. Used the I-3K (I-3000) Bus bus. GSat 10 Communication satellite built by ISRO for Insat, India. Launched 2012. Used the I-3K (I-3000) Bus bus. GSat 16 Communication satellite built by ISRO for Insat, India. Launched 2014. Used the I-3K (I-3000) Bus bus. GSat 15 Communication satellite built by ISRO for Insat, India. Launched 2015. Used the I-3K (I-3000) Bus bus. GSat 18 Communication satellite built by ISRO for Insat, India. Launched 2016. Used the I-3K (I-3000) Bus bus. GSat 17 Communication satellite built by ISRO for Insat, India. Launched 2017. Used the I-3K (I-3000) Bus bus. Chandrayaan 2 Lunar lander operated by ISRO, Roskosmos, India. Used the I-3K (I-3000) Bus bus. 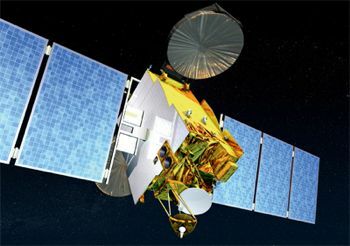 MEASAT 4 Communicationsatellite built by ISRO (Antrix) for MEASAT Satellite Systems Sdn. Bhd.. Used the I-3K (I-3000) Bus bus. Family: Communications. Country: India. Launch Vehicles: Ariane 5, Ariane 5ECA, Ariane 5GS. Launch Sites: Kourou ELA3. Bibliography: 6580, 12636. 2008 December 20 - . 22:35 GMT - . Launch Site: Kourou. Launch Complex: Kourou ELA3. LV Family: Ariane 5. Launch Vehicle: Ariane 5ECA. Eutelsat W2M - . Mass: 3,460 kg (7,620 lb). Nation: France. Agency: Arianespace. Program: Eutelsat. Class: Communications. Type: Civilian communications satellite. Spacecraft: I-3K. USAF Sat Cat: 33460 . COSPAR: 2008-065B. Apogee: 35,843 km (22,271 mi). Perigee: 35,735 km (22,204 mi). Inclination: 0.10 deg. Period: 1,436.20 min. 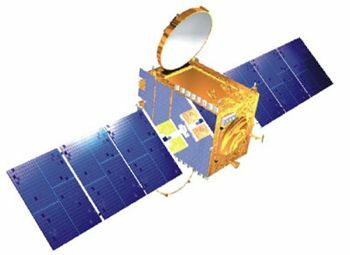 Ku-band satellite designed to operate at 10 deg E. It used the Indian Insat I3K bus and was the first foreign sale of an Indian-built satellite. It made it to geosynchronous orbit but suffered a power system and was written off eight days after launch..
2012 September 28 - . 21:18 GMT - . Launch Site: Kourou. Launch Complex: Kourou ELA3. LV Family: Ariane 5. Launch Vehicle: Ariane 5ECA. 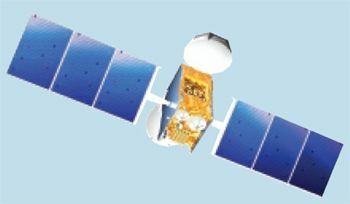 GSAT-10 - . Mass: 3,435 kg (7,572 lb). Nation: Europe. Class: Communications. Type: Civilian communications satellite. Spacecraft: I-3K. USAF Sat Cat: 38779 . COSPAR: 2012-051B. Apogee: 35,798 km (22,243 mi). Perigee: 35,777 km (22,230 mi). Inclination: 0.0200 deg. Period: 1,436.12 min. 2014 December 6 - . 20:40 GMT - . Launch Site: Kourou. Launch Complex: Kourou ELA3. LV Family: Ariane 5. Launch Vehicle: Ariane 5ECA. 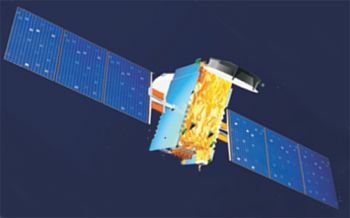 GSAT-16 - . Mass: 3,180 kg (7,010 lb). Nation: India. Class: Communications. Type: Communications satellite. Spacecraft: I-3K. USAF Sat Cat: 40332 . COSPAR: 2014-078A. Apogee: 35,802 km (22,246 mi). Perigee: 35,772 km (22,227 mi). Inclination: 0.11 deg. Period: 1,436.12 min. Communications satellite for the Indian Space Research Organization with Ku and C band payloads. Stationed in geosynchronous orbit at 55 deg east..
2016 October 5 - . 20:30 GMT - . Launch Site: Kourou. Launch Complex: Kourou ELA3. Launch Vehicle: Ariane 5. GSAT-18 - . Nation: India. Class: Communications. Type: Communications satellite. Spacecraft: I-3K. USAF Sat Cat: 41793 . COSPAR: 2016-060A. Apogee: 35,831 km (22,264 mi). Perigee: 24,135 km (14,996 mi). Inclination: 0.50 deg. Ariane vehicle L585 mission VA231, placed two communications sats in geotransfer orbit. GSAT-18 was for the Indian Space Research Organization..